Police Chief Shelley Zimmerman said Monday that even with the new police contract it will take time to rebuild a department that is down 153 officers. Zimmerman declined to suggested a timetable, but said the police academy can graduate as many as 200 new officers in a year’s time. “It will depend on what the attrition rate is. But it also depends on how many people we put through the academy,” she said, adding that it costs the city $191,000 to train each new officer. Earlier on Monday, the San Diego City Council unanimously approved a five-year contract with the San Diego Police Officers Association that includes 3.3 percent raises in each of the deal’s final two years. The contract is designed to make San Diego Police competitive with other law-enforcement agencies. 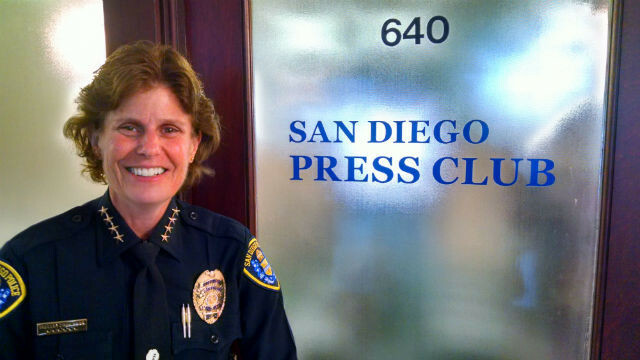 Zimmerman spoke after the council meeting to a group of journalists at the San Diego Press Club as part of the professional organization’s monthly “Newsmaker” series. In addition to the raw number of officers, she said, it will take time for new officers to develop experience as detectives and in other specialized areas. “We have lost so much leadership over the years — hundreds of officers,” she said. Asked about the recent investigation by the Justice Department into police misconduct under her predecessor, Zimmerman said the problems stemmed in part from the loss of experienced officers. Zimmerman grew up in Cleveland, OH, and first visited San Diego after a Rose Bowl game in 1980 and decided to move here. She started her police work doing undercover drug investigation at Patrick Henry High School, where she made over 100 purchases, she recalled. In the end, 70 students were arrested.